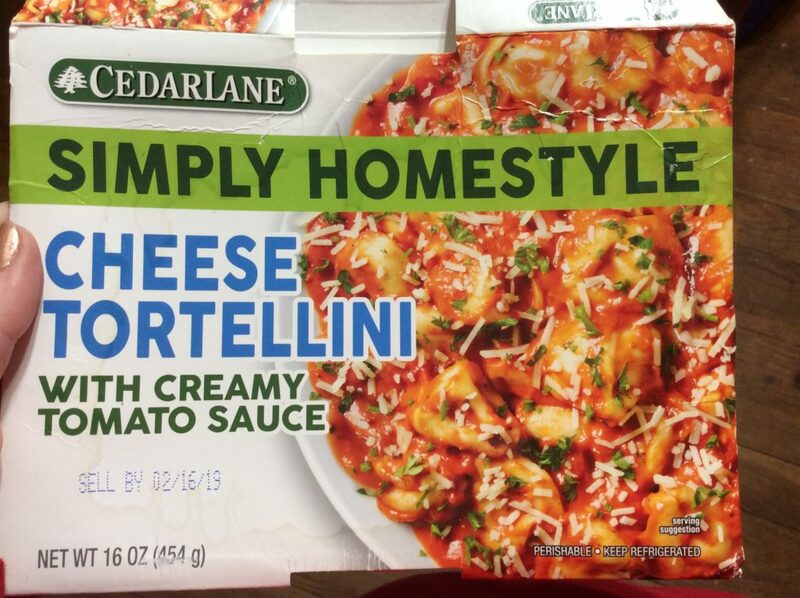 I had not heard of Cedarlane before I found this refrigerated Cheese Tortellini meal at Grocery Outlet. It turns out that Cedarlane is a 40-year old company that sells frozen and refrigerated food. 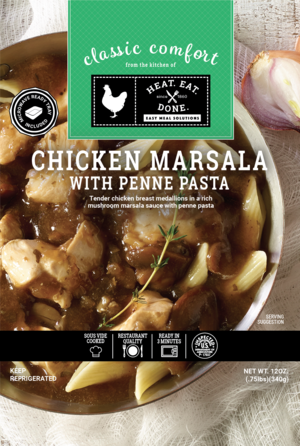 I couldn’t find this exact item in their website, but they do show several intriguing vegan meals I’ll try to find (they apparently sell this brand at Lucky Supermarkets). This tray meal of tortellini in tomato sauce was basic but tasty. I liked how soft the tortellini were. There are three servings in this meal, but I can’t imagine that it would satisfy more than one as a full meal. It was $5 at Grocery Outlet, so I imagine it costs significantly more at the supermarket. At $5 is a good meal, I’m not sure I’d pay any more than that. 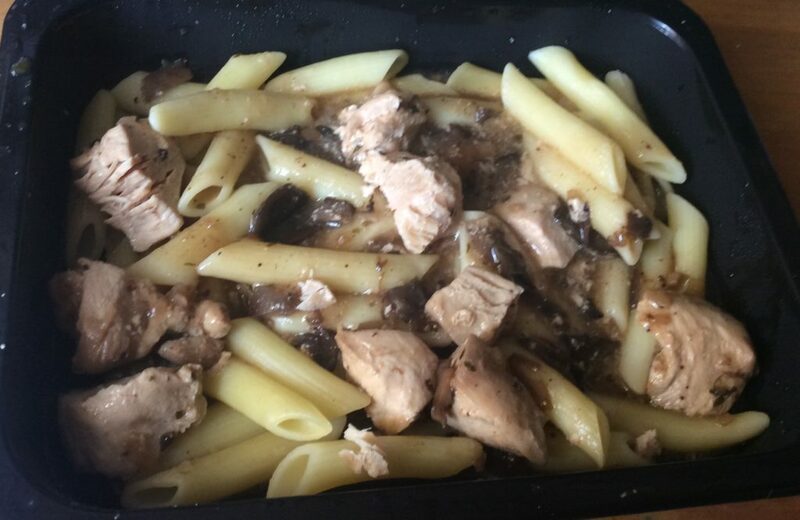 I’m once again in a funk about cooking, so I’m back at eating frozen meals from time to time. 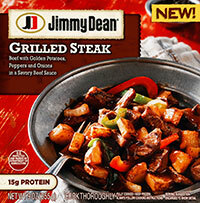 Grocery Outlet is now carrying the Jimmy Dean Delights brand, which I hadn’t seen before. 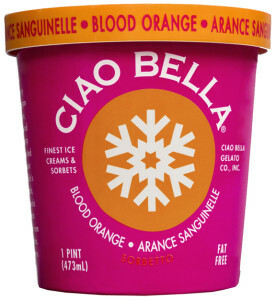 It’s pretty much just like every other frozen food brand – forgettable. I had their pulled pork sandwiches in chipotle bbq sauce. An acceptable snack for $1.50, but with too much bread to meat ratio. 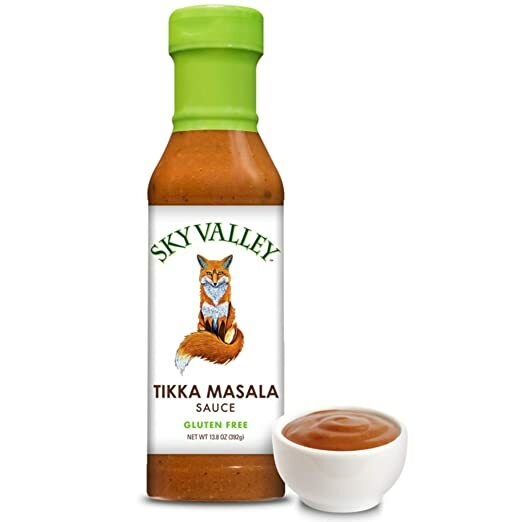 The pork is pretty much a paste (not chunks as in the promotional photo), and the sauce tastes like your generic tangy/sweet bbq sauce. My vegetarian oldest was OK with the three cheese pasta bowl, but she’s not that demanding. The grilled steak bowl was edible but unmemorable. The photos on the boxes definitely look better than the real thing tastes. I’ve been kind of lazy about making dinner lately, and what is easier and tastier than grilling some hot dogs or sausages? Grocery Outlet, meanwhile, has had an explosion of sausage choices this week so we were able to try a few new ones. The winner of this batch was Open Nature Smoked Uncured Sausages. This is actually the Safeway brand of sausages. These are 100% pork sausages. 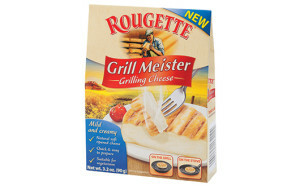 They are pretty big, with four sausages in the 12 oz package, and very tasty. That’s probably because they are full of fat, 23 grams for one of these vs. 15 grams for one of the Gilbert sausages below (which are 1/2 oz smaller). 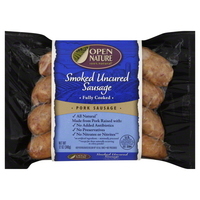 Still, if you’re going for flavor, you can’t go wrong with these sausages. Mike rated them an 8.5. 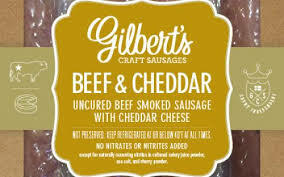 Gilbert’s Craft Sausages is a very new company (started in 2010) offering “gourmet” uncured beef sausages. I got the beef & cheddar and we thought it was pretty good. Mike would rate it a 6.5. Camila, my 9 yo, liked it – and she can be picky. It had a nice flavor, not very overwhelming, and was pretty juicy. I think I might enjoy it more without the cheddar. One convenient thing about Gilbert’s sausages is that they are individually wrapped. The bad thing is that they don’t have the type/expiration date printed on the plastic, so I still have to keep the carton in the fridge to remember what they are. A 10 oz package of 4 sausages was, I think, $3 at Grocery Outlet. 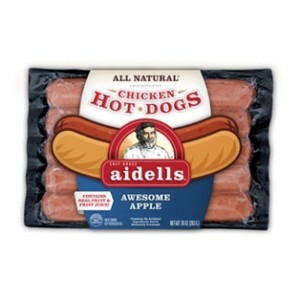 Finally, one of my kids like chicken sausages and we often buy the Aidells kind. 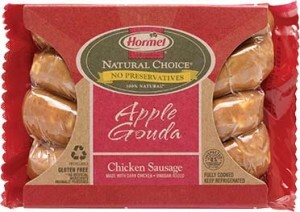 There were none at Grocery Outlet, buy they had Awesome Apple uncured chicken hot dogs. The 10 oz package has 5. Both kids really liked them and they seem marginally healthier, with 7 grams of fat each. But one kid had to eat two to get full, and the other 3 . Of course, the kids gave them a “10”. My oldest says she prefers these to the sausages as they are thinner and easier to eat, plus they look smaller. Less messy too. One good thing about these chicken apple hot dogs is that they don’t have pork casings. Aidells chicken sausages don’t either, but other manufacturers do. If you are specifically avoiding eating pork products (as my daughter is), this matters. I got these at Grocery Outlet yesterday. They were only 50-cents, or so, as today was the expiration day. I was going to use them in quesadillas, but we ended up eating them whole. All in all, they were good, but so sweet that none of us wanted to have a second sausage (and at 3 oz, they aren’t that big). My youngest particularly enjoyed how juicy it was. 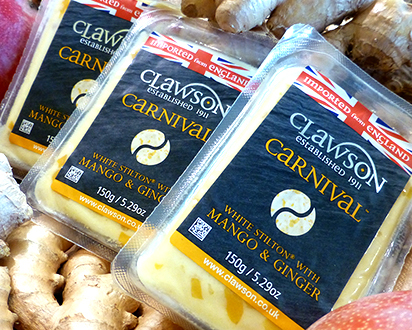 The cheese, indeed, seems to be there more to provide juiciness than flavor. They are actually made from “natural” ingredients: chicken, Gouda cheese, dried apples, brown sugar, vinegar, salt, paprika and spices. They are in pork casings. I don’t know that I’d buy again, unless they were on sale at 50-cents.